PHOENIX, AZ. Jan. 31, 2018–KM Coatings, a manufacturer of commercial grade liquid-applied roof systems, announced today the rebrand of the business. The updated branding includes new logo, tagline “Quality Roof Systems for Professionals”, packaging and website. KM Coatings is a manufacturer of roof coatings and primers used to restore and extend the service life of a wide array of roofs. 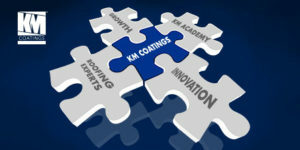 To support its growing customer base, KM Coatings is expanding its manufacturing capacity, investing in continuing education for roofing contractors through the new KM Academy, and increasing its national team of roofing experts. The new KM Coatings will be officially unveiled at the International Roofing Expo in New Orleans, LA, Feb. 6-8; booth 811. See the new brand identity at www.kmcoatings.us. KM Coatings has been manufacturing liquid-applied membranes for over 30 years and joined the Polyglass U.S.A., Inc. family in 2014. KM Coatings offers a complete selection of acrylic and silicone elastomeric roof coatings in a variety of colors. When applied over an entire roof, KM Coatings roof systems cure to form a seamless membrane and can extend the service life of an existing roof by 5-20 years. For more information visit kmcoatings.us.